It was a rare rainy June day in San Francisco as I crossed the San Rafael Bridge to meet The Shark Bus headed for Sacramento. Supporters of AB 376 were on our way on the Capitol to stand up for sharks and against the sale of shark fins in California. But ours was a small group compared to the well financed opposition bussed up from Chinatown. The fight has pitted influential Chinese American politicians against one another and Chinese traders and restaurant owners have spent large sums of money to hire lobbyists to oppose a ban. Busloads of Chinatown residents descended on the Capitol, saying that a ban would violate cultural custom. In fact, the folks we spoke with didn’t seem to care much, it seemed that most were just along for the ride. 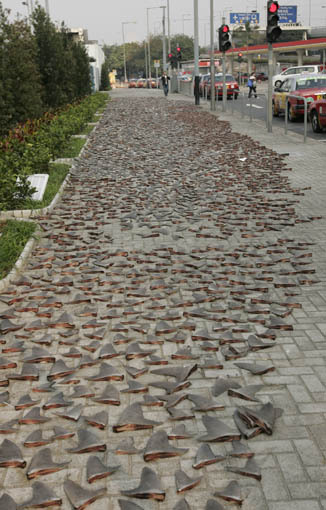 Last April, Assembly members Paul Fong (D-Cupertino) and Jared Huffman (D-San Rafael) introduced AB 376 at the California Academy of Science – proposing to make it illegal to sell, trade or distribute shark fins in California, which is one of the largest markets for fins outside of Asia. Houston Rockets basketball star Yao Ming has joined other celebrities, such as Leonardo DiCaprio and Scarlett Johansson, in public support of a ban. “Remember, when the buying stops, the killing can too,” says Ming in this riveting video. 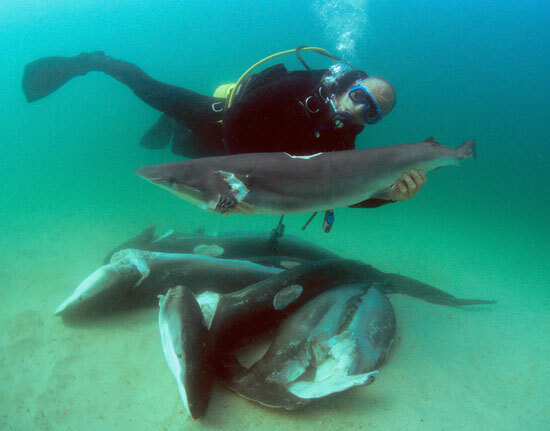 Scientists say the fin trade has contributed to the catastrophic declines of shark populations worldwide, threatening to disrupt ocean ecosystems and encouraging the proliferation of other predators, which diminishes stocks of fish for human consumption. Experts from the Monterey Bay Aquarium and The California Academy of Science are in strong support of the bill, and increased protection for sharks worldwide. 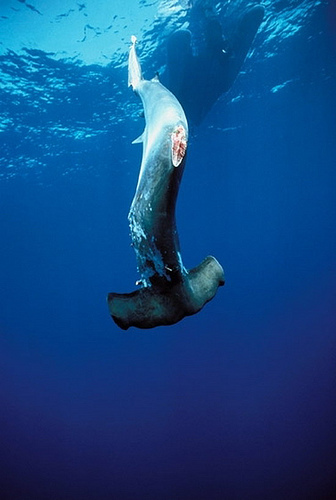 Shark finning has taken a horrifying toll on sharks, many species of which are now facing extinction. As much as 90% of the world’s sharks are already gone, and overfishing is the main culprit, with up to 100 million shark deaths each year. The practice is inherently cruel. Sharks are usually finned and thrown overboard alive. Unable to swim, they sink to the bottom to die a slow agonizing death. Shark fin soup is strictly a luxury taste. Costing as much as $80 a serving in restaurants, it has been a Chinese delicacy for hundreds of years and often is served at weddings and banquets. It is a status symbol, considered to have medicinal properties, and its defenders see its consumption as a cultural right. Listen to what ‘Her Deepness’ Sylvia Earle has to say about what ‘luxury tastes’ are doing to our entire ocean planet, Click Here for her full BBC Interview. But a growing number of Asian-Americans support AB 376. The Asian Pacific American Ocean Harmony Alliance, for example, is a coalition of Asian Americans artists, scholars, environmentalists, elected officials, and community leaders who support a ban on the sale of shark fins. According to this group, thousands of years of eastern philosophy emphasize living in harmony with nature — not destroying it to make soup. 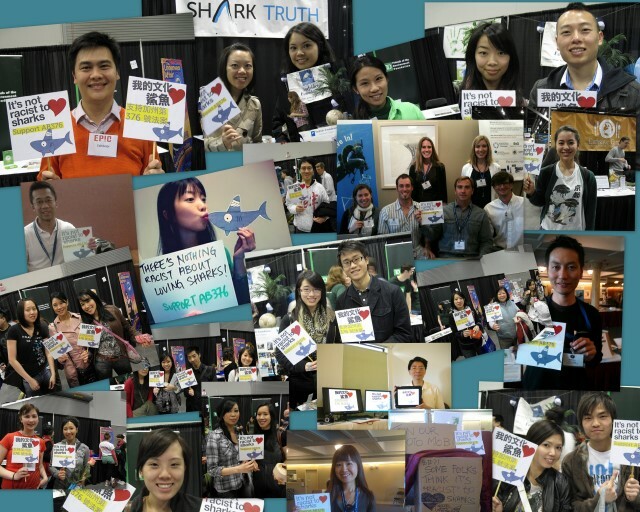 And a group of young Asian activists have started a ‘Sharkfin Photomob.’ ‘It’s not racist to love sharks’ is their motto, and their quickly growing website of supporters has been impossible for legislators to ignore. A compromise may be difficult to defend and enforce. To ban the sale of imported fins while allowing the sale of California fins would violate international trade rules. In addition, when you allow some but not all fins, it becomes impossible to enforce. The bill passed the Assembly last month, 65-8, but is having more difficulty in the Senate. Tuesday, in a packed hearing room, the bill passed the Senate Natural Resources & Water Committee 7-0, but only after Fong agreed to work with opponents to amend the bill before it goes before the Senate Appropriations Committee. It is not expected to reach the full Senate before August. Hawaii and Washington state have already passed shark fin bans, and President Obama earlier this year signed federal legislation tightening a ban on shark finning in U.S. waters. Its important that we not lose momentum now in California. Its going to take a continued push to get AB 376 through the Senate, so please keep the pressure up by writing and calling your Senators – it really does make a difference! The most important calls to make for now are to the Appropriations Committee. The hearing date is 7/11/11. Urge these Senators to vote YES on AB 376!